Whaddya do when your bread-and-butter band slows down due to a crazy little thing called life? Form another one. 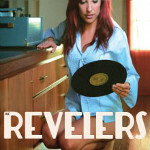 That’s what most of the Red Stick Ramblers did by forming alter ego band the Revelers for something totally different. [iframe class=”spotify-right” src=”https://embed.spotify.com/?uri=spotify:album:5RjuMsmTxmRlegWQpfCqhz” width=”300″ height=”380″ frameborder=”0″ allowtransparency=”true”]Buy on iTunesBuy on Amazon The U.K.’s Kent Records’ out-of-print Lafayette Soul Show anthology provided inspiration for how more South Louisiana dance music can always be unearthed, in addition to being the source of Jewell & the Rubies’ overlooked “Kidnapper.” “I’m Glad for Your Sake (But I’m Sorry for Mine)” is another such gem, with drummer Glen Fields turning in a terrific performance as an emotive crooner. Swamp pop has a strong presence here but it’s not always your classic power horns, heavy keyboard-pounding variety — instead often an acoustic-centric one with bluesy fiddles, jazz-tinged guitars and a Tex-Mex sounding accordion.